OnThursday, April 15, at the Kennedy Space Center in Florida, the President willoutline a bold strategy for human spaceflight that increases the NASA budget by$6 billion over the next five years. His plan represents an ambitious effort tofoster the development of path-breaking technologies; increase the number,scope, and pace of manned and unmanned space missions; make human spaceflightsafer and more efficient; and help create thousands of jobs. ThePresident will lay out the goals and strategies in this new visionfor NASA, including a sequence of deep-space destinations matched togrowing capabilities, progressing step-by-step until we are able to reach Mars.He will provide new information about specific elements of the plan, includingproceeding with a scaled-down variantof the Orion space-capsule technology developed in the Constellationprogram (to support crew escape requirements on the International SpaceStation) and setting a decision date for moving from research to developmentand production of a heavy-lift launch vehicle. In addition, he will speak tothe new technologies, new jobs, and new industries this approach will createalong the way. Thisnew strategy means moremoney for NASA, more jobs for the country, more astronaut time in space,and more investments in innovation. It will result in a longer operatinglifetime for the International Space Station, new launch capabilities becomingavailable sooner, and a fundamentally more ambitious space strategy to take usto an increased number of destinations and to new frontiers in space. Byundertaking this strategy, we will no longer rely on our past achievements, andinstead embrace a new and bold course of innovation and discovery. AdvancesAmerica?s commitment to humanspaceflight and exploration of the solar system, with a bold new vision andtimetable for reaching new frontiers deeper in space. IncreasesNASA?s budget by $6 billion over 5 years. Leadsto more than 2,500 additional jobs in Florida?s KennedySpace Center area by 2012, as compared to the prior path. Beginsmajor work on building a newheavy lift rocket sooner, with a commitment to decide in 2015 on thespecific heavy-lift rocket that will take us deeper into space. Initiatesa vigorous new technology development and test program to increase thecapabilities and reduce the cost of future exploration activities. Launchesa steady stream of precursor roboticexploration missions to scout locations and demonstrate technologies toincrease the safety and capability of future human missions, while alsoproviding scientific dividends. 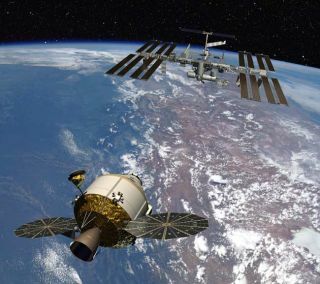 RestructuresConstellation and directs NASA to develop the Orion crew capsule effort inorder to provide stand-by emergency escape capabilities for the Space Station ?thereby reducing our reliance on foreign providers. Establishesthe technological foundation for future crew spacecraft needed for missionsbeyond low Earth orbit. Increasesthe numberof astronaut days in space by 3,500 over the next decade, extends the lifeof the International Space Station, likely beyond 2020, and enables thelaunching of astronautson new vehicles from the Kennedy Space Center 1- 2 years sooner. Jumpstartsa new commercial spacetransportation industry to provide safe and efficient crew and cargotransportation to the Space Station, projected to create over 10,000 jobsnationally over the next five years. Investsin Florida, adding $3 billion more for the Kennedy Space Center to manage ? a60 percent increase. Makesstrategic investments to develop critical knowledge, technologies, andcapabilities to expand long-duration humanexploration into deep space in a more efficient and safe manner, thusgetting us to more destinations in deep space sooner. Andputs the space program on a more ambitious trajectory that pushes the frontiersof innovation to propel us on a new journey of innovation and discovery deeperinto space. Aset of stepping-stone achievements in space that will take us further andfaster into space, allowing us to reach a range of destinations including lunarorbit, Lagrange points, near-Earth asteroids, and the moons of Mars, andeventually Mars itself. This sequence of missions will begin with a set of crewed flights to prove thecapabilities required for exploration beyond low Earth orbit. After theseinitial missions, our long-duration human spaceflight technologies will enablehuman explorers to conduct the first-evercrewed mission into deep space to an asteroid, thereby achieving anhistorical first; venture into deep space locations such as the Lagrange points(potential sites of fuel depots that would enable more capable futuremissions to the Moon, Mars, and other destinations); and then send humansto orbit Mars and return them safely to Earth. Todemonstrate a concrete timetable and commitment for expanding human explorationfurther, the President is announcing that, in addition to investing in transformativeheavy-lift technologies, he will commit to making a specific decision in2015 on the development of a new heavy-lift rocket architecture. Thisnew rocket would eventually lift future deep-space spacecraft to enable humansto expand our reach toward Mars and the rest of the solar system. This newrocket would take advantage of the new technology investments proposed in thebudget ? primarily a $3.1 billion investment over five years on heavy-liftR&D. Thispropulsion R&D effort will include development of a U.S. first-stagehydrocarbon engine for potential use in future heavy lift (and other) launchsystems, as well as basic research in areas such as new propellants, advancedpropulsion materials manufacturing techniques, combustion processes, and enginehealth monitoring, all of which are expected to shorten the development timefor any future heavy-lift rocket. Thenew rocket also will benefit from the budget?s proposed R&D on otherbreakthrough technologies in our new strategyfor human exploration (such as in-space refueling), which should makepossible a more cost-effective and optimized heavy lift capability as part offuture exploration architectures. A decision in 2015 means that major work onbuilding a new heavy lift rocket will likely begin two years sooner than underthe troubledConstellation program. Our goal is to take advantage of the best work undertakenin the Constellation program. The President is announcing that NASA willrestructure the Orioncrew exploration vehicle program to a simpler and more efficient designthat will be focused on crew emergency escape from the International SpaceStation. Under the Constellation program, the Orion crew capsulewas intended to house astronauts during their travel to the International SpaceStation and later missions to the Moon. It also was to be capable of docking atthe Space Station for six months and returning crews to the Earth. As part ofthe President?s new plan for NASA, the development work already performed onthis capability will be re-oriented to meet the important safety requirement ofproviding stand-by emergencyescape capabilities for astronauts on the space station. We will be able to launch this vehicle within the nextfew years, creating an American crewescape capability that will increase the safety of our crews on the SpaceStation, reduce our dependence on foreign providers, and simplify requirementsfor other commercial crew providers. This effort will also help establish atechnological foundation for future exploration spacecraft needed for humanmissions beyond low Earth orbit and will preserve some critical high-techcontractor jobs in Colorado, Texas, and Florida. ShouldRobots or Humans Do Our Cosmic Exploring? ShouldNASA Go Back to the Moon? WhoWill Get Us There: NASA? China? Private Enterprise?